This week we have part two of the Desert Nomads module series, adventure module X5: The Temple of Death. This adventure is a direct continuation of the previous one, picking up at the entrance to the Great Pass which leads from the Sind Desert into the land of Hule, where the Master reigns. Where the previous module's Sind was inspired by Hindu mythology, this module is a bit reminiscent of Lovecraft's Dream Cycle. Hule would not seem out of place in the Dreamlands, and a couple of the new monsters have a distinctly Lovecraftian feel to them. The hideous elephant-thing on the cover is a malfera, which is described as being native to 'The Dimension of Nightmares'. 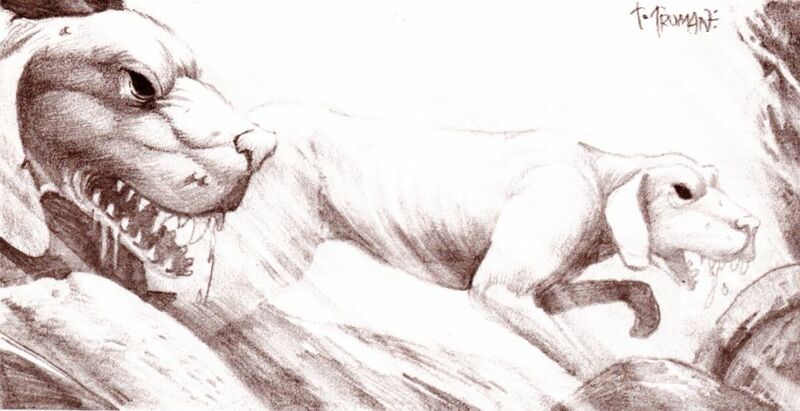 This module also introduces the Spectral Hound which is basically a Hound of Tindalos and hails from the 'Dimensional Vortex.' For now that just means they're extra creepy and unnatural, but the Immortals Set will eventually work the Dimension of Nightmares and the Vortex into a cosmology unique to Mystara. The bite of a spectral hound can cause a character to fade from reality entirely. The first portion of the adventure covers the trip through the Great Pass. As with Master of the Desert Nomads there are encounters to be used no matter which way the adventurers travel, but there are also a number of placed encounters including a fake dragon head being used to guard the entrance to the pass, a tribe of geonids (small creature which look like boulders), and a mammoth that falls from the sky and has a chance to crush a character (a roc dropped it). Also there's the Well of the Moon. The Well has a number of powers, but the most fascinating is that on nights with a full moon a ladder of moonbeams appears and the characters can climb it to reach the Kingdom of the Moon. Said Kingdom is left to the DM to create and the module states "If you do not want the players to go to the moon, you may ignore this power." It seems to me that travelling to the moon might get the party a bit sidetracked, but what do I know? Once through the Great Pass, the part reaches Hule which is rather dark and unpleasant. Hule is described as a hagiarchy, ruled by "holy men." The Master is the ultimate ruler, watching over things from the Temple of Death. A group of secret police called the Diviners search for criminals, both of the traditional sort and those guilty of having "wrong thoughts." It's portrayed as a fairly functional country on the whole, although one unwelcome to free thought. As their mission is to seek out the Temple of Death, it's assumed the adventurers will do that and attempt to find and destroy the Master. If they investigate enough, they can piece together bits of information telling of a holy man named Hosadus who is connected to the Master and may even be able to determine that they are the same person. The Master is actually an avatar used by Hosadus to rule over Hule while his real, ancient and scarred, body lies in a casket in the Temple's mausoleum. To truly destroy the Master the party will have to find and destroy the body of Hosadus. It's possible, though unlikely, that the party could avoid having to face the Master entirely if they figure this out early enough. 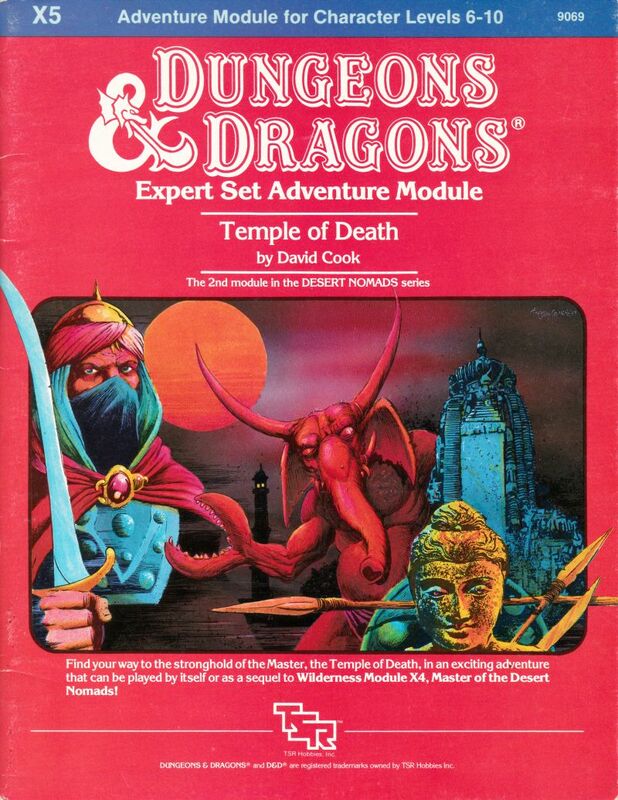 Temple of Death is a solid module that presents a challenging foe as well as a new country that can be connected to the existing maps of the Known World (it hooks on west of the map from module X4), and adds a lot of fascinating elements to the cosmology of the world. Hule is also described in sufficient detail to give a good DM a base to work on to use it as a setting for more adventures. It's not surprising at all that Hule and the Master get revisited in a later module, as this one and its predecessor were very well received.